A memorial building commemorating World War I veterans was first authorized during the 1929 Legislative Assembly. It was decided that it would be a joint city-county community center. The city would fund $125,000, with $84,000 from the county. With nearly 75% support, Bismarck voters overwhelming approved the debt limit increase and bond measure to finance the building, through a special election held on May 31, 1929. It was the city’s largest election turnout to that point. The cornerstone was laid December 31st of that year. It was formally dedicated on January 9, 1931. The Art Deco-style building deployed the most modern construction techniques of the time, from its heating system to its steel frame supporting 700,000 bricks. While the building originally honored primarily World War I veterans, it has since expanded to celebrate other veterans, namely those of World War II. The World War Memorial Building was designed with intent of having a diverse usefulness. Upon completion, it contained the largest convention hall in the state, along with a first-class gymnasium. Space was reserved in the basement for the future addition of a swimming pool, but its unconfirmed if this was ever achieved. The state legislature met there while the new state capitol was undergoing construction, which was completed in 1934. In the mid-to-late 1950s, plans were discussed to expand the building, but lack of funding stopped such plans from progression. 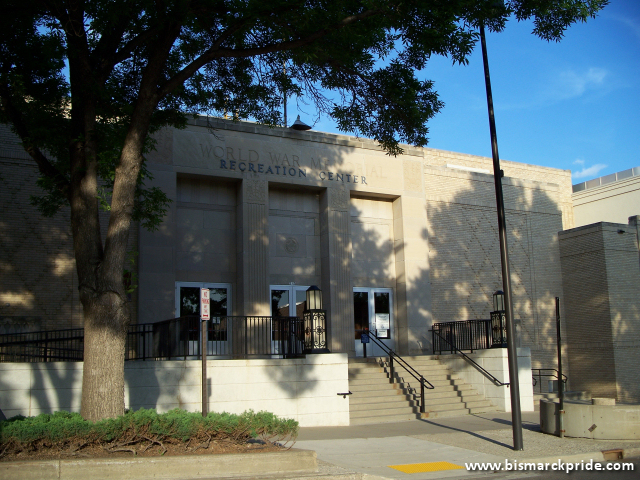 Voters, instead, authorized the Bismarck Civic Center in 1967.